Some of my favorite posts to read (and write!) are In My Kitchen. Pop over to Fig Jam and Lime Cordial for a list of posts, and perhaps you’d like to join in too? I thought I wouldn’t be posting this month, but things kept catching my eye, so here I am again with a few things to show you. a skull! We went out for a walk last week and Kaya found this half a skull and wanted to take it home. It is in the kitchen because I have become the mediator in a silent war between Kaya and Lulu. Lulu wants to chew on the skull, and Kaya wants to scrutinise it and pull out its teeth. (That is why it looks a bit dishevelled.) And it turns out that it once belonged inside the head of a wild boar. kombucha in various stages of fermentation. The one on the right is a second fermentation with ginger and turmeric to make it fizzy (and delicious), and the one on the left is a new batch that I fermented with osmanthus oolong tea. I was extra excited about that one, since I really love osmanthus tea. Because I took this photo almost a week ago, I can now report that the tea retains all of its loveliness when fermented with a kombucha culture. Interestingly, the Domestic Man posted a profile of an interesting business in Portland OR called Salt Fire and Time. They seem to make exceptional bone broths (which can be purchased online, if anyone’s interested) but also deal in flavoured kombucha, including osmanthus! I first encountered these flowers in Hangzhou, where they burst into bloom in early autumn and perfume the entire city. They don’t look like much (think daphne flowers) but they have a sweet fruity scent that is hard to forget. It’s the stuff of Proustian flashbacks to be sure. I have been reading and using Nigel Slater’s lovely little book, Eat, a lot lately. Sometimes a cookbook will become the source of all knowledge for a spell, and this one helped me out of a few jams recently. Ali brought home a whole quarter of a lamb not too long ago and I ended up with a few cuts of meat (after a crash course in lamb butchery) that I am not accustomed to cooking, like lamb belly. There was a wonderful recipe in Eat for it, and one for lamb fillet, or loin, as well. Then, while reading through, I noticed a recipe for a Spanish tortilla that called for “banana shallots.” I thought that sounded appealing and a little humorous, and wondered if they were something that I could grow. Imagine my surprise when I caught sight of these elongated shallots among the alliums at the market not too long afterwards! They are very delicious, and since Ali is away for a few days I have been subsisting on Spanish tortillas. Thanks for stopping by my kitchen! What an amazing skull! And Eat is one of my favourite cookery books. 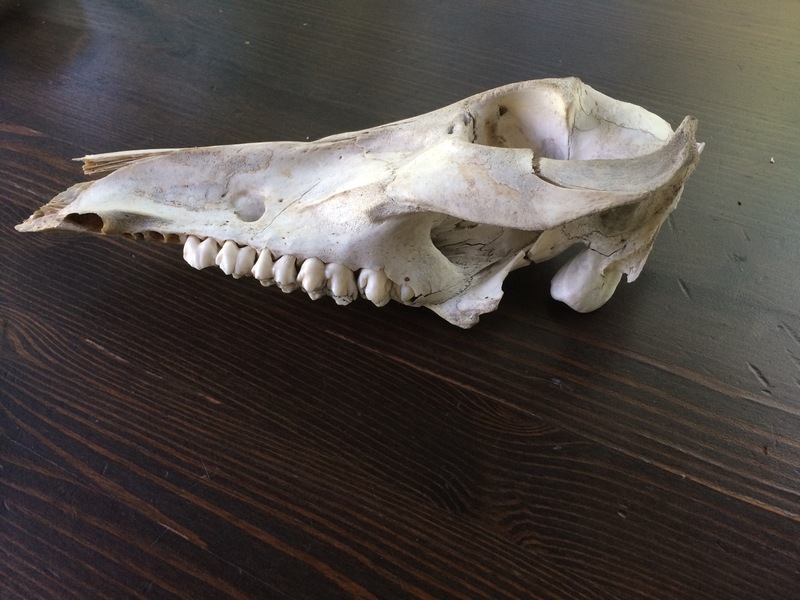 A wild boar skull in the kitchen makes for interesting decor. And the Kombucha bottles are very large- what will you do with it all? We drink a lot! The batch on the right will be gone by the time the new batch is ready. Fantastic skull! These type of shallots are, indeed, delicious. 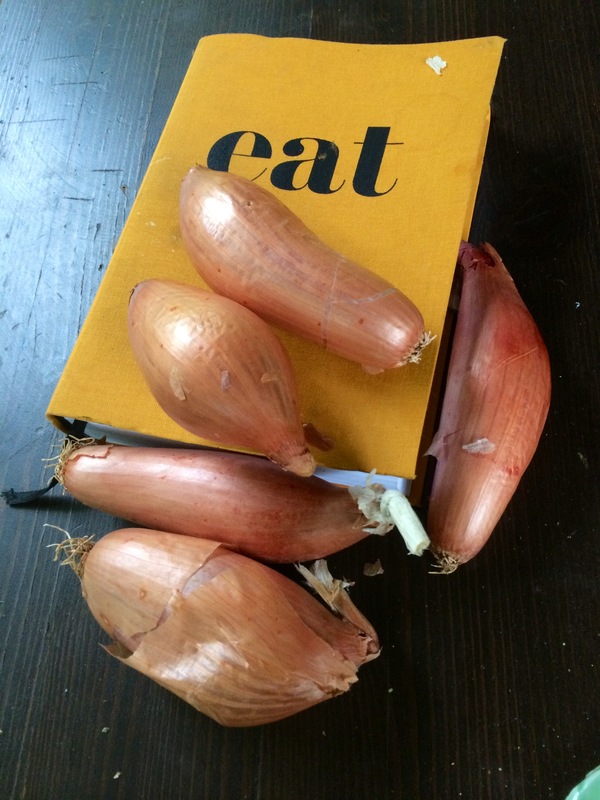 They’re sometimes called échalion shallots here in the UK, originating in France, I think. I hope that I can find them again – they were a real treat, and not as fiddly to peel and slice as the small ones. Aren’t they funny? I thought for a moment that they were some odd form of banana when I saw them and then the penny dropped. Wow, what an interesting and informative post! 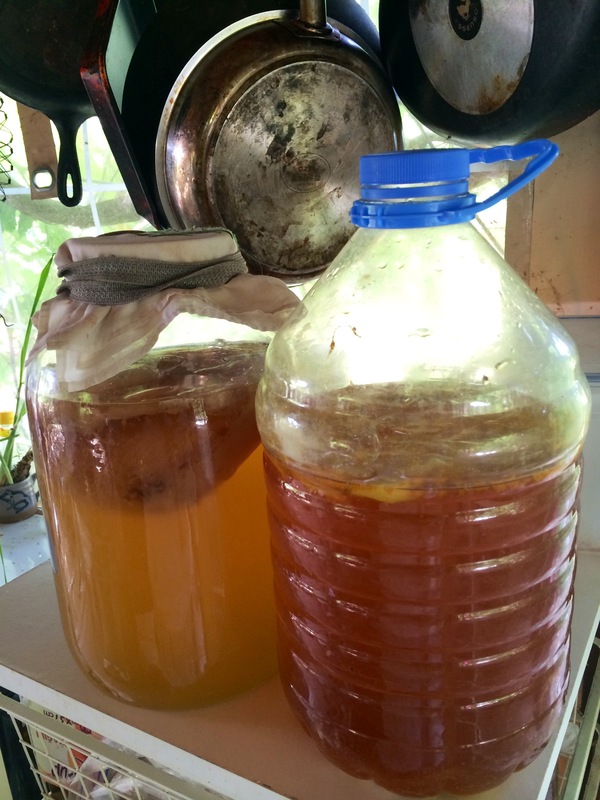 I’ve been very curious about kombucha as I know it is good for us, but I’ve never tasted it. I’m quite sure it is like many things that are good for us, some taste better than others, depending on who is making it, so I’m waiting to find one that is the ‘real deal’! Generally I like fermented things. I make my own bone broth and use as beef stock in soups and stew recipes. It is SO good, and much better than anything the grocery has, but of course more trouble to make, though not much. I brown the bones in the oven then put them in the slow cooker with a few flavourings and let them slowly transform all day. Sorry for going on… thanks for playing IMK! I haven’t tried the kefir that ferments water yet, only the milk one. I’m curious, though. Thanks for stopping by! Great skull! Kombucha sounds amazing. Wondering if you plant one of the shallots and it grows, will it flower and produce seeds that you can use to grow your own banana shallots?